I always have a few eBooks checked out from the library. When I am at home, I read all my eBooks on my Android tablet using the free OverDrive app. I recently discovered that I can download the OverDrive app to my iPhone and sync my books so that I never loose my place, even when I switch between devices. Following the steps in this tutorial, you can read your eBooks on a device with a larger screen at home, but have the option to read with just your cell phone when you are out and about. 1. Download the OverDrive app, and log in to your OverDrive account on all the devices you want to use to read your books. Have a look at this tutorial if you want more details on how to do that. 2. Check out an eBook from your library. Do this by opening the OverDrive menu (Swipe left to right or tap the three horizontal bars in the top left corner). Then select your library. This takes you to your library’s selection of digital books. Select a book you want to download, and click Borrow or the equivalent. (The option will vary between libraries.) This moves the title to your library bookshelf, but not to your device-specific OverDrive bookshelf. 3. Download your book to all the devices that you want to use for reading. To do this, open up the OverDrive app on each device, and go to your library’s bookshelf. All of the eBooks you currently have checked out will be visible there. Click Download, and choose the EPUB eBook format before clicking Confirm & Download. This copies the book to your device. 4. Now that your book is downloaded to your device, it will show up in your OverDrive Bookshelf. Access it by clicking Menu>Bookshelf. All the titles you have downloaded on the device you are using will show up here. They disappear when they are returned to the library. Tap on a book to open it, and start reading. 5. 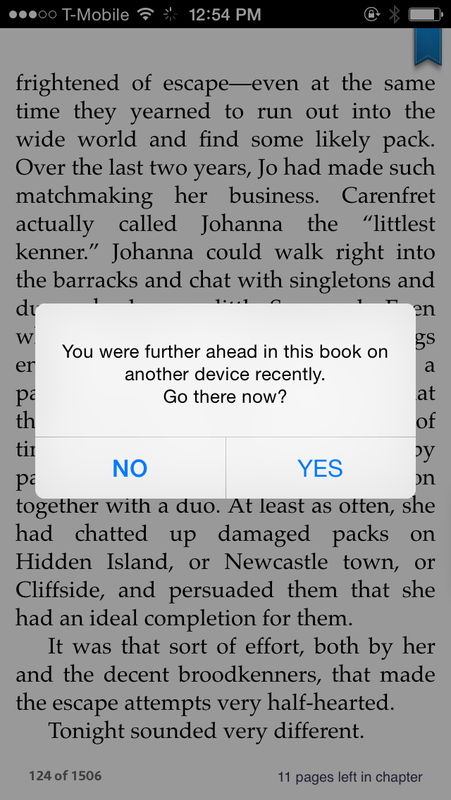 When you switch between devices and open your book in OverDrive, you will get the following message: “You were further ahead in this book on another device recently. Go there now?” Hit Yes, and it will take you to the page where you left off.